Welcome to “Understanding the Iran-Contra Affairs,” the only comprehensive website on the famous Reagan-era government scandal, which stemmed from the U.S. government's policies toward two seemingly unrelated countries, Nicaragua and Iran. Despite stated and repeated denials to Congress and to the public, Reagan Administration officials supported the militant contra rebels in Nicaragua and sold arms to a hostile Iranian government. These events have led to questions about the appropriateness of covert operations, congressional oversight, and even the presidential power to pardon. 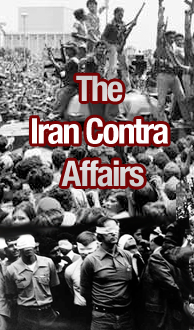 “Understanding the Iran-Contra Affairs” provides information about the rise of the contra rebels in Nicaragua and about the Iranian Revolution, as well as the U.S. responses to both. 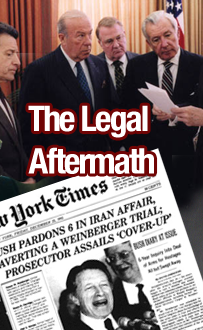 Moreover, the website details the media's discovery and later press coverage of the Affairs, and the subsequent televised congressional hearings. This website also describes the investigations and prosecutions of government officials conducted by special prosecutor Lawrence Walsh. This website was built to serve as an effective teaching, as well as learning, tool. Each of the topics will raise questions about lying to Congress, the role of the special prosecutors, and executive power. 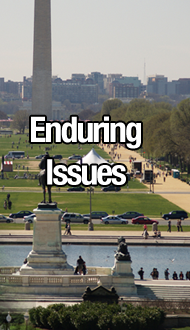 In our Enduring Issues section, we have laid out some questions for discussion. In this way, “Understanding the Iran-Contra Affairs” not only provides a comprehensive look at the Iran-Contra Affairs, but it provides a framework for thinking about other government controversies too. The site is split into four main sections, linked below and from the images above. The black and beige navigation bars contain links to supplemental resources. Read about the backgrounds of Nicaragua and Iran and how their histories affected their role in the Affairs. 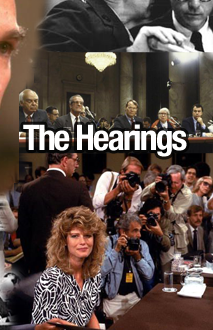 Watch the hearings and see how each player defended the role he/she played. Read information on the Walsh investigations and find out who is prosecuted (or not) and who is pardoned. Analyze the implications the Affair has on the foreign policy and on the American government.